Hey friends, first off I want to apologise for the lack of recipes the last two weeks. We’ve had a lot going on and I needed to take a little break from blogging for a while. The exciting news is that we have bought a house in a village just outside of Ely and as if that wasn’t stressful enough we are moving in the week before Christmas! So my stress levels have been a tad high, but I’m getting super organised now and I have some time to share a recipe with you today. This recipe is lovely, it’s a warm winter salad that is really quick and easy to make and tastes amazing. 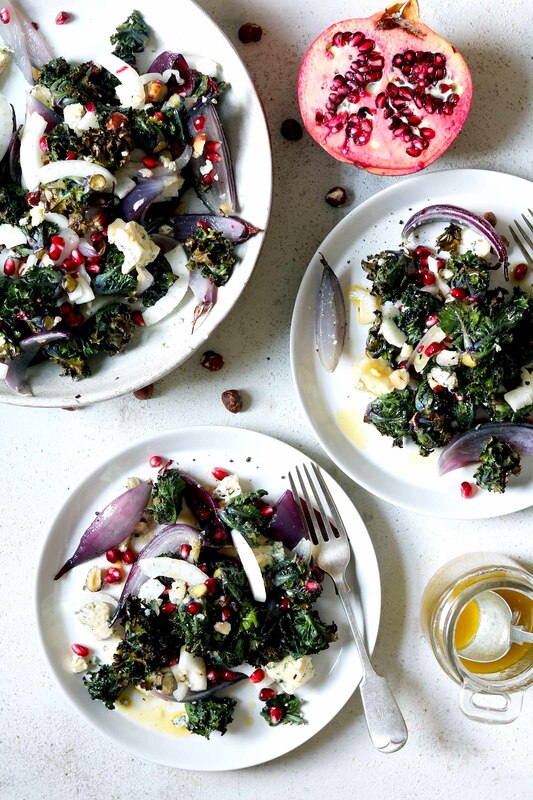 This winter salad of roasted kalettes, red onions, hazelnuts, pomegranate seeds and Stilton cheese is a great salad for entertaining over the holidays. It’s quick and easy to make and comes with a tangy, red wine dressing. Kalettes are a fairly new vegetable and if you’ve not tried them yet then you may want to give them a try. They are a cross of kale and Brussels sprouts, they are really quick to cook and have a lovely nutty taste. They are in season from November to April and are great on their own or in a nice Winter salad like this one. I roasted the kalettes and the red onions for this salad, the kalettes only take about 10 minutes to cook so get the onions in the oven first. The onions are sweet and soft and go lovely with the nuttiness of the kalettes and the aniseed flavour of the fennel. I use Stilton for this salad, it’s strong and salty flavour is great against the kaletees and onion, but if you’re not keen on blue cheese then I would recommend a good goat’s cheese instead. Juicy pomegranate seeds add a lovely sweetness to this salad and hazelnuts add a little crunch. I made a tangy red wine dressing to go with this winter salad but an orange vinaigrette would work great too. A warm Winter salad with roasted kalettes, red onions and Stilton cheese. Served with pomegranate seeds and hazelnuts and a tangy red wine vinegar dressing, this salad is perfect for entertaining over the holidays. Preheat the oven to 180 degrees C, 356F. Add the red onions to a baking tray drizzle over 1 tbs of the oil then roast in the oven for about 10 minutes. Then remove the tray from the oven, add the kalettes, the remaining oil, the sea salt and the black pepper and toss gently. Return the tray to the oven and roast for a further 10 minutes. When the kalettes and onion are done transfer them to a serving dish. Add the fennel, pomegranate seeds, hazelnuts and Stilton then toss gently. To make the dressing whisk all the ingredients together and serve with the salad. I like to serve the dressing on the side for people to add as much or as little as they like. Roasted Butternut Squash with Sage & Walnuts. I have never heard of kalettes. They sound amazing. Two of my favorite veggies combined. And this salad… I can’t wait to try it. It looks divine. Good luck with the move. How exciting!